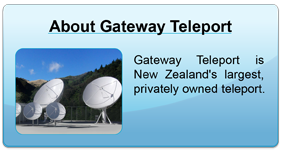 About Gateway Teleport - Gateway Teleport Ltd. - Gateway Teleport Ltd.
Gateway Teleport Ltd. is the largest and most modern privately owned Teleport in New Zealand. 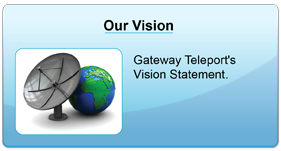 Gateway Teleport is staffed by personnel that have a wealth of satellite experience and a commitment to the development of the company. We are a Satellite Solutions provider providing services to customers in New Zealand, Australia and the Pacific Islands. Our services include Video Contribution, Data Connectivity and Customer Hosting from our Teleport located in Maidstone, Upper Hutt, New Zealand. Gateway Teleport can also offer our customers Network design and installation services through our extensively experienced staff and arrangements with equipment suppliers. Our Teleport services provide large Antenna Ku-Band services on Intelsat IS-18 and Optus D2 satellites as well as C-Band services on either Intelsat IS-18 or SES NSS-9. Also operating from the Teleport is Optus Satellite Network’s CSM System for their D1, D2 and C1/D3 satellites New Zealand footprints. We operate a 1.2 metre Data Flyaway system that is capable of providing Disaster Recovery services and Special Event requirements throughout New Zealand and the Pacific through our iDirect Hub operating on IS-18/8K Ku-Band. Gateway Teleport provides SD/HD Video Uplink services with redundant uplinks on Intelsat IS-18 and Optus D2 Ku-Band as well as the ability to offer turnaround services. In the near future this will also be operational on C-Band with a remotely steered Antenna capable of accessing the C-Band orbital Arc from 105E to 183E in both Linear and Circular Polarizations. Our High Rate Fibre connectivity through DTS Ltd., enables us to Downlink SNG feeds from anywhere in the Intelsat IS-18 or Optus D2 footprints and deliver these internationally or domestically in New Zealand. Alternatively the customer can deliver to the Teleport by Fibre and have this Uplinked in any of the beams serviced. (Telecommunications) and Accredited Radio Certifier (by RFS New Zealand).